At 4 am, the village sleeps. Two headlights stir from the north side of the valley, joined in their illumination by the Milky Way galaxy – Orion, the Dippers, Nahga. Six-inches of fluff puffs away like talcom powder with our first steps off the deck. Jackets zipped to the core, hoods up, two humans, one wolf-dog and a universe around us. We gilde down the driveway, the cold piercing the skin, letting us know that this winter is alive and good. Into the willows, breaking trail, and across the creek, a small hole in the water with a gurgle to remind us of spring, summer. We turn due west, up a road but really, in this year of great snows, a passage for skis, much too deep for any car tracks. Dead silence, the world small, limited to our two headlights. Elaine's silouettes me and my shadow leads the way through the forest. The trail rises, turns at a switchback, and begins the steady climb. Our spirits are high. This was an unplanned adventure, created by an inability to sleep and a pending departure. I'm to catch a plane to land of the mundane in five hours, and this is our small victory against it. An ode to the mountains, to mountain living, to all that is right and good in this world. As we climb, the cold penetrates our lungs. In and out, in and out, the breathe of life…up the mountain. It is good this world of mountain skiing. I read a tale earlier of a man named Jackrabbit who skied up and down the Appalachians in the early part of the 20th century. He lived to 111. He was skiing at 100. I hope to replicate this, which means I'm about 1/3 through with my skiing career. The trail steepens. As we crest the top, a gust of wind picks up, chilling the cheeks. Down below, a handful of lights in the village, early morning risers off to work, making coffee, enjoying the still. To the west, the divide is illuminated in all her splendor, haunting white in the dark, sillouettes of peaks towering above. We make our way to the top of the run. An enchange of smiles, a kiss, a hug, for this is the great moment. A stop to savor it all, and then a skin rip. So much beauty up here, so much love at 4:45 in the morning. I want Elaine – who has been sick for the past two weeks – to enjoy this. She's earned it. Down the summit ridge, a whoop ahead, perfection. The snow is light, fluffy and deep. 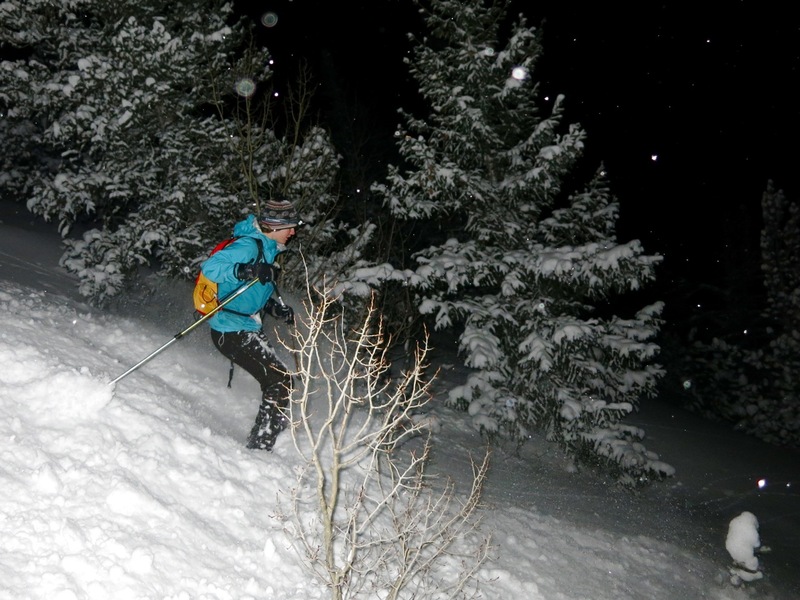 It's THAT good, and our bright headlights make our ski through the trees feel like a James Bond scene. Down the ridge and onto the face, powder deep. I'm feeling it, feeling good, letting my turns slide then carve, swoop, feel the steepness. A few turns in there to carry me through the summer. A feeling of being superman. Down the right chute, no hesitation, faster, where I meet Elaine, giggling in ecstacy. It really is that good. We switch places, me in the lead, linking tight turns on our mountain. We know it like the back of our hand, but not like this, so deep, so dark, so alive. A final turn and onto a trail no more than 12-inches wide, over and around pines, speeding, breathing. A hard left, a harder right, a tree belay and then down the final luge chute to a sweeping left hand turn, like those made by Olympic ski racers at the end of their winning run. Hands raised in the air, because on this very early morning, we win. After grins and more hugs we quietly put our skins on. It's a short jaunt back home and across the river and the willows. As we emerge into the clearing before our home, Elaine pauses and says, "I think I hear an owl." We wait thirty seconds and there it is, a distant yet distinct, "whooo, whooo." The wild in the dark village. Nature is still on the edge here, the wild at our doorstep. It is, in my opinion, the most beautiful place to be this morning. This is what carries me through the next four days of meetings, of powerpoints, of flourescent lights, of sales goals. Those perfect turns, the brilliant headlamp in the deep dark, the love, the wild. This is the place, the valley, the mountains we call home.